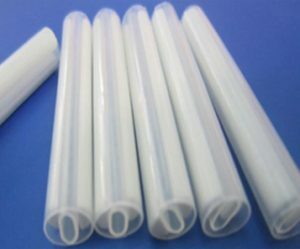 This products is made up of cross linked polyolefin heat-shrinkable tubes,hote melt tubes and Stainless steel needle. It is specifically designed for the protection of fiber optical closure. Protect connection point,improve the mechanical strength,it is most reliable way to protect the fusion.Esay to operate,reducing the risk of fiber damage during installationTransparenttube,it is easy to see the status of fiber optical closureMin.shrinks temperatuer:120℃,shrink very fast and very easy to installationWork temperature high (-55°C~100°C), widely usedSealing structure let closure have good resistance to temperature and humidity performance. This sleeves are characterized by increased size (D=6.4mm after shrinking), the ability to secure up to 12 fibers in one sleeve and quickness of assembly (below 95s). 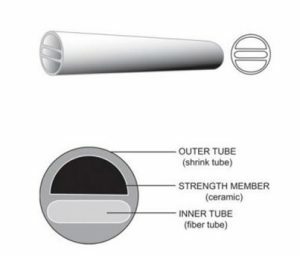 The sleeve consists of two D-shaped ceramic strengthening elements (dimensions 1.8x4mm), a thin external tube and an internal tube with a 1.3x4mm hole. Such a solution enables using those sleeves to protect bar fiber-optic cables with a 250um cover and a 900 um buffer. The internal tube is made from special material with good adhesion to many materials and low solubility in water. It changes its consistency to semi-liquid in growth temperatures. It enables to eliminate air bubbles through filling up the spaces between external tube, the Pin and fiber optic cable. The Pin that stiffens the splice is made from ceramic with heat extensibility indicator identical to that of optic fiber. This prevents from longitudinal stresses on the splice during heating process. Longitudinal stresses of the splice influence on growth a insert loss and a reflection loss. In extreme cases they may cause breaking the connection, which makes it necessary to repeat the splice procedure. External tube material guarantees sustainability and resistance to stretching and puncture. It offers optimal air permeability, high gloss and smooth surface. It fulfills the requirements of UL224 and MIL-I-23053 standards.